Ding ding ding! The winner of glitter madness, by a healthy landslide, is officially Zoya Julieanne! A dark, inky glass flecked purple, Julieanne is a gorgeous shade that packs all sorts of vampy goodness. 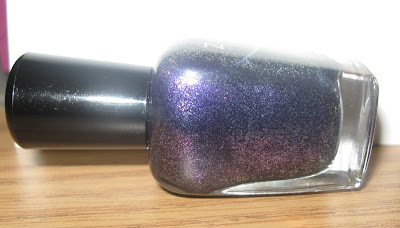 It is also a dupe for Orly Out of this World from the Cosmic FX collection. You can see the punch of this deep grape in the bottle, long before you even put it on! The only complaint that I have is that unlike its Orly counterpart, Julieanne doesn't show off any duo-chrome sparkle on the nail. I love how from some angles, she looks almost speckled. This would be under sunlight conditions. With the warm weather making an appearance here in Jersey, let's go for a little Sunshine and Summertime. Zoya Breezi, Mira, Faye, and Reva are asking for your vote. So get to it!